The Microaces Spitfire joins the P51D Mustang and Focke Wulf Fw190 kits released last year and expands the range of kits now available from the new manufacturer. The Spitfire uses the same construction methods and materials as the previous kits including Depron Aero, reinforcing carbon fibre spars, an aileron servo and the unique Microaces printed sticker material that makes the airframe so incredibly crash resistant. However, like the original Mk1 Spitfires, this 1/24th scale replica has a lighter wing load than both the Mustang or Fw190, making it more stable at lower speeds, easier to control in most manoeuvres and therefore also suitable for less experienced pilots. The kit assembles in 6-8 hours, comes with comprehensive assembly instructions and requires no special skills or previous experience, just a few common tools and a spot of patience. All that’s needed to complete the kit is a Spektrum AR6400/AR6410/AR6400L/AR6410L micro receiver, a compatible transmitter plus a few single cell Lipo batteries. The Spitfire kit is a replica of a MkIa Serial No. N3162 in service during the Battle of Britain in 1940. It was famously flown by the highest scoring British pilot of the conflict, Eric Lock, who became a household name for his tally during the conflict. 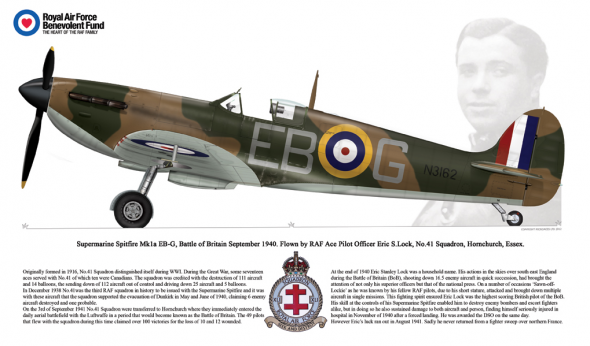 More can be found out about Eric’s history and that of the Spitfire on the Microaces Website. The RAF celebrates its 95th birthday in April 2013. To mark this occasion and help raise money for the RAF Benevolent Fund, Microaces has launched its Spitfire MkIa kit for pre-order before its official availability in May. For every Microaces Deluxe Kit pre-ordered, £5 will be donated to the RAFBF to help them continue the great work they do.